A particle moving faster than light speed, should Nature allow it, disappears from any observer's view as the motion of that particle is tracked through light speed! Light is only an intermediary tool, necessarily limiting our observation of motion to the speed of light. Note that in physics, anti-particles occur at energy mC2 or precisely when particles are energized at speed C of light or higher; yet anti-particles appear in accelerators in spite of the fact that particles are not allowed to reach speed of light! The idea is that in these conditions (that are real) a particle may disappear from view, because it reached speed of light, rather than desappear into its anti-particle! And that becomes possible with gravimotion's interpretation of physics «motion relativity» §1.10.5, specifically in view of Comment-I at bottom of that page. Using conventional language of speed and position, suppose a particle travels on a linear trajectory right to left from A to B, then to D and to E; and that from A to B its speed is slower than light so we can observe it and do observe it. Then let us assume the particle at B is given energy greater than mC2, like 2mC2 or 3mC2 labeled XmC2. In spite of the laws of physics, it is now travelling faster than light (at greater speed than light C), and we optically lose track of it (it disappears!). Now suppose that at the position D it is slowed down and from there on travels at a speed slower than light, so we can see it again. Placing an observer in O, let say that the light takes exactly a split second to get from B to O. Now if we assume that the particle between B and D has been accelerated faster than light at such a speed XmC2 that it traveled the distance B-D in exactly half a split second, because the distance D-O is chosen to be half of the distance B-O, the observer will see the particle simultaneously in B and D.
In my opinion, this is exactly what happens in accelerators, when physicists claim that pair’s particles antiparticles are formed or disappear and reappear. A bat, which perception of the outside world is based on sound waves rather than light waves, might see a single flying supersonic plane overhead in 2 different places at same time! 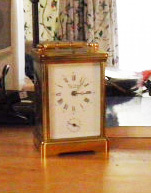 One "rewinds" the clock, with a key and "turning" it round and round. 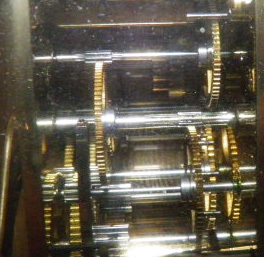 The "motion stored" into a mechanical spring "runs" the mechanism of the clock for 1 week! Another type of motion storage is found in batteries which can make electrical motor "run". Gasoline is another mode of motion storage now stored in the tank of your car.